Watch 28 February episode of News Fuse from OTV. 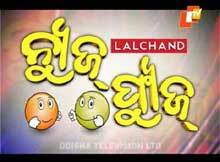 This show is very popular among all age groups of Odia tv viewers. Best part of the show is its content with relative songs and anchoring of Kuna Tripathy, which will make you laugh and aware of the truth simultaneously. This episode has fuses related to political leaders in airport, BJP fund collection from streets, family planning operations by Asha Didis, garbage vans in Balasore municipailty, people in Samata Kranti Dal sabha and crocodile bike in Punjab. Enjoy!